San Manuelito CEBE (Centro Educativo Basico Especial– Center for Basic Special Education) is located in San Ramon, in the province of Chanchamayo, gateway to the central rain forest, or “selva central” of Peru. After about a ten-hour bus ride from Lima, the capital, the view changes within minutes from incredible greenery along the highway to extreme poverty. Many students live with single mothers (fathers often abandon their children with disabilities) and lack clean water to drink. Two years ago, major changes took place at the school. Many students were transferred to regular public schools and placed in inclusive general education classrooms, with support from special education teachers. This is the model used in the United States (and required by federal law) where, to the maximum extent they are able, and with support, children with disabilities are educated in the same environment as their peers. There are currently 25 children with the most severe disabilities housed at San Manuelito School and 60 students placed in 38 inclusive classrooms throughout Chanchamayo. All of the students have severe disabilities, including autism, cerebral palsy, Down Syndrome, hearing and vision impairments, as well as severe multiple disabilities. The majority are nonverbal. The staff of San Manuelito includes seven teachers (three at the school itself and four working with children in the inclusive programs), a psychologist, a social worker, a maintenance person, and four assistants. Catherine Paola Krammer Davila is director. 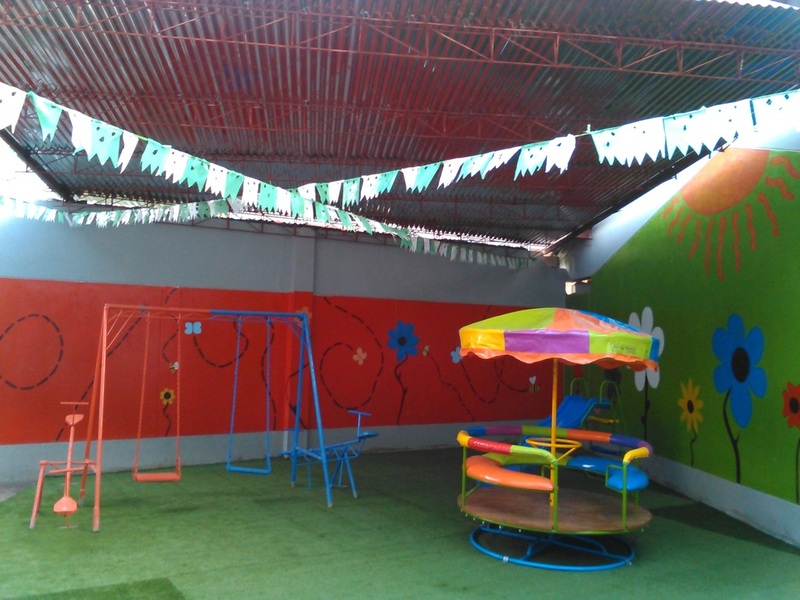 A PRITE (Programa de Intervencion Temprana) early intervention program for babies and toddlers with disabilities is also located at the school. This is the first school we “adopted” and the staff have become our close friends. Although we have been able to provide them with some needed resources, they have given us much more – their welcome, their example, and their friendship. Our biggest project on our 2015 trip to Peru was the Richie Jeffs Playground at the San Manuelito School. 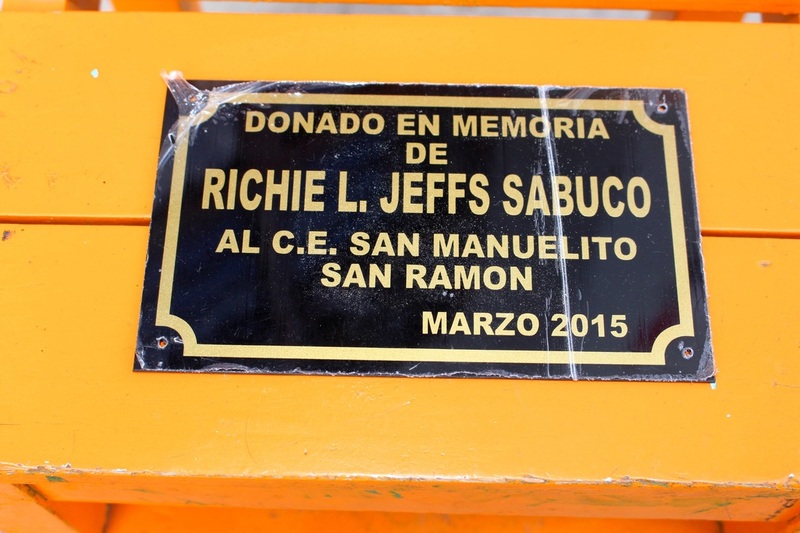 The playground was dedicated to the memory of our grandson, Richie Jeffs, who passed away after heart surgery in 2014. Richie went to Peru with us in 2011 and completed his Eagle Scout project of providing hygiene kits to the families of students at San Manuelito. His dream was to return. In March, 2015, Richie's mother, Gloria, a Peruvian native, went there in his place and used money from his college savings to purchase a merry-go-round and slide for the school. We were thrilled to discover when we arrived that the parents' organization had built a roof above the new playground. Because San Ramon is in the rain forest, protection is critical. And not only that - about 20 university students from throughout the United States were there volunteering with the Foundation of International Medical Relief of Children (FIMRC). They had painted a beautiful bright sunshine and flowers on the walls next to the playground area. We were lucky to get to meet and talk with many of the students. Catherine Paola Krammer Davila, the director of San Manuelito, had previously asked if we might provide a covering for the dirt base of the playground. We had looked at materials in Lima and brought samples to the school. The plan was to first lay a concrete floor, then cover it with turf material. We hired a contractor to do the work and the playground floor is now complete. 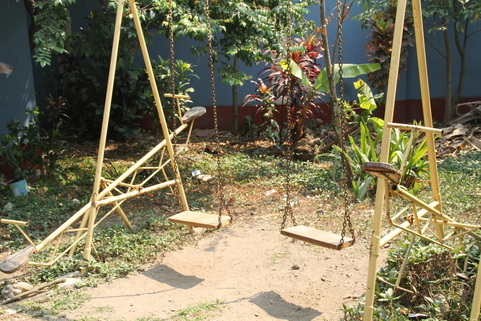 Next year, we hope to purchase additional play equipment.